Even though I had been in Basel for three christmas's, I'd never once seen Fasnacht. Patrick had, of course, known and loved this festival since he was a child. I am so proud of him as this past year he has learnt to play the trombone to take part in Fasnacht with Grachsymphoniker. I remember even in the years we were in Australia, he would be up in the middle of the night watching the live stream on the internet. I didn't quite get it! Now I do. Basler Fasnacht has made the UNESCO list for Intangible Cultural heritage and it is referred to as die drey scheenschte Dääg (the three most beautiful days). The only way for me to describe it is an explosion of colour, music and art. 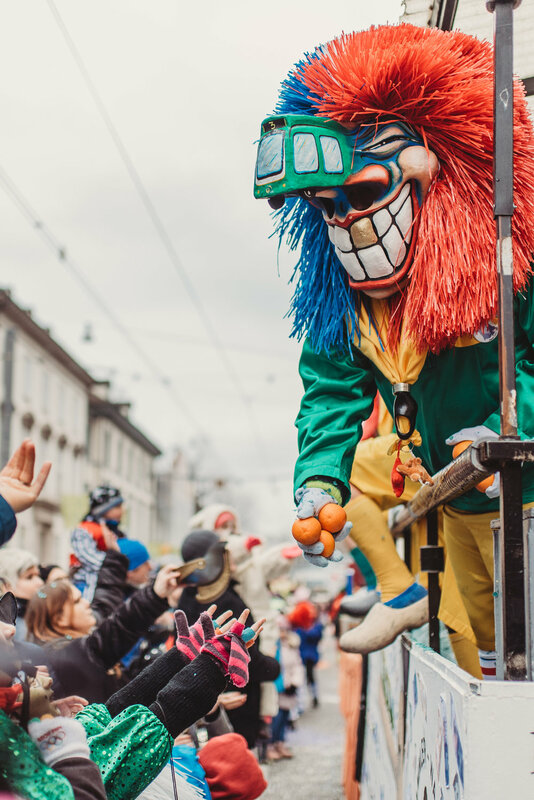 There are many similar festivals nearby in Switzerland and Germany however the Basel Fasnacht is the most well-known. It also has its own unwritten rules (i'll detail some of them below) and 'Baseleans' can always spot (and frown upon) the outsiders when they don't follow the 'rules'. 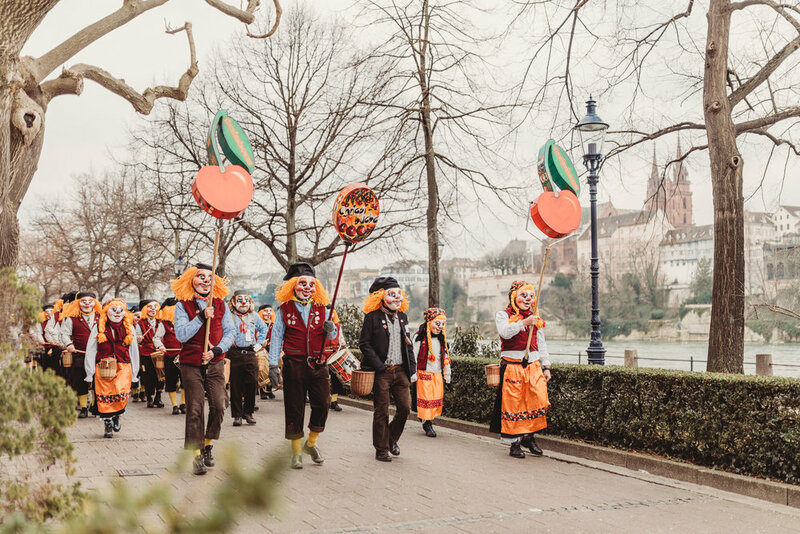 Fasnacht begins with people pouring down the streets of basel early on Monday morning making their way to the city for morgestraich. This alone was quite a surreal experience. Getting up before 3am to cram on a tram with adults and children alike dressed up in their festive costumes and then walking over the mittlerebrücke with hundreds of others, wishing each other 'schöne morgestraich'. You can feel the buzzing energy as people anticipate the start of the carnival. At exactly 4am, the city lights go out. Even stores which are open have to block out their windows. All you can see are the colourful lanterns and all you can hear the sound of piccolo's and drums as they parade in the old town of Basel. Each of the Fasnacht groups, called cliques, choose a theme which is conveyed in their lantern artwork and costumes. They comment on social and political issues and are usually highly satirical. I heard someone say that Fasnacht takes the dark and turns it into light! 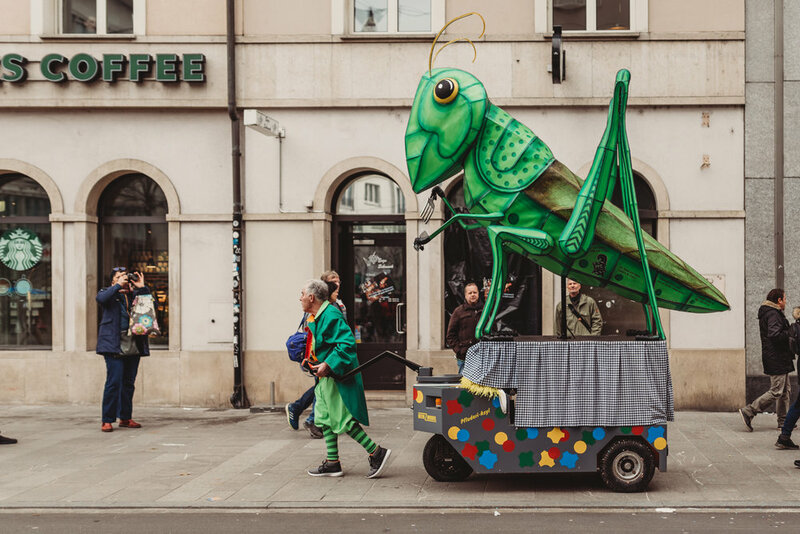 This year we saw the 'Ballistic Games' featuring North Korea and USA in an olympic style parade and also a few featuring 'bugs' commenting on the newly opened restaurant that sells a burger made from insects! The carnival lasts for exactly 72 hours - finishing on Thursday morning at 4am. I spoke to a band member who said Fasnacht has so many elements of life in it - It has joy, music, love, colour, humour and celebration, but because it runs through the night, you can feel exhausted. It also highlights some pretty grim themes happening in our world (even if it is in a humourous way). It was incredible to hear some of the members of Grachsymphoniker had injuries (or injured them self during the carnival) yet continued through pain to be part of it. You witness great loyalty and team spirit amongst the bands. A parade (Cortège) of all the groups happens Monday afternoon and Wednesday afternoon. All the shops close so everyone can enjoy the festivities. It consists of the guggemusik (brass bands), cliques (pipers and drummers) with their lantern floats, and waggis wagen. People (mostly kids) will hold out their hands and call after the waggis to give them treats - they hand out flowers, fruit and vegetables, drinks (even beer! ), lollies and loads of confetti! Most of the kids are after the lollies - I witnessed a child get quite disappointed when he put his hand out and received a carrot! Confetti (Räppli) is only sold, bought and thrown in individual colours. This was put in place to stop people reselling 'used' confetti. You also should not pick up confetti from the floor and throw it again - make sense... who wants confetti mixed with dirt thrown in your face? Fasnacht is renowned for its masks, not painted faces as it is in other carnivals. You'll stick out like a sore thumb (perhaps not in a good way) if you paint your face rather than wear a mask. There may be times you have to cross the parade route to get to another location - its is disrespectful to cross through a band, you should wait until it has passed and cross between bands. On this same note, you should always move out the way for the bands. More than likely, they will not stop/move for you anyway, so if you don't want a drumstick in your face - make way! When they turn the lights off at 4am for morgestraich it should be be dark - photo flashes are frowned upon! A couple of other things you should know is that Fasnacht is loud and crowded and takes over the entire city. The trams don't run through the city which means you'll have to put on your walking shoes. Due to the close proximity to the smoking-loving swiss, you'll probably inhale quite a bit of smoke too (and thats not including the smoke bombs they often let off). But the joy, music and celebration is worth the inconveniences. I definitely think that everyone going through Basel should experience it! Guess what!? 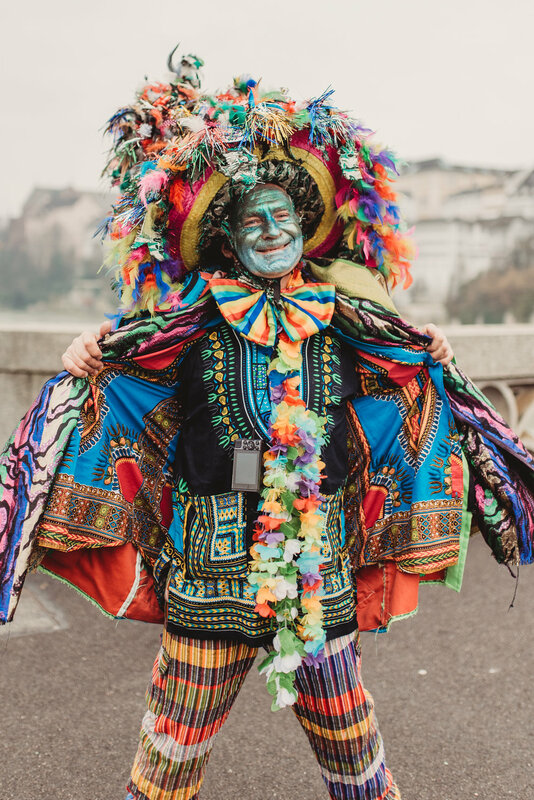 I’m running mini sessions in the 2019 Basel Fasnacht. Check out this post for more info.